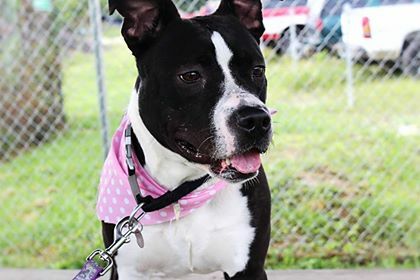 This beautiful 3 year old is Cora. She knows a few commands (sit, stay and come). Cora gets excited when it comes time for walking. She loves being outside in the grass that she tends to pull while walking and will need to work on some leash training skills. Cora really likes to play with toys. Squeaky and fluffy toys are at the top of her list. She loves to have her ears and belly rubbed. She is typically laid back and tries to keep her cage neat and clean, but her toys have a way of exploding. Cora has mixed emotions about other dogs, sometimes she is happy wagging her tail going through the kennel other times she is going at some of the dogs through the cages. Cora is very loving and is always wanting so show her affection by cuddling or giving kisses. She is always a happy girl to see you. She can be playful. When playing outside she likes to tuck down super low to the ground and then pounce to give kisses and then roll over for belly rubs. Cora does ask the her new family makes sure there are lots of treats especially bacon flavored ones (they are her favorite). Cora is current on all shots and is spayed and micro-chipped. Part of her adoption fee has been sponsored. Cora is one of our longest residents. Would you like to adopt one of the dogs from the shelter? Fill out this application first!